Vision y Compromiso | Who Are Promotores? 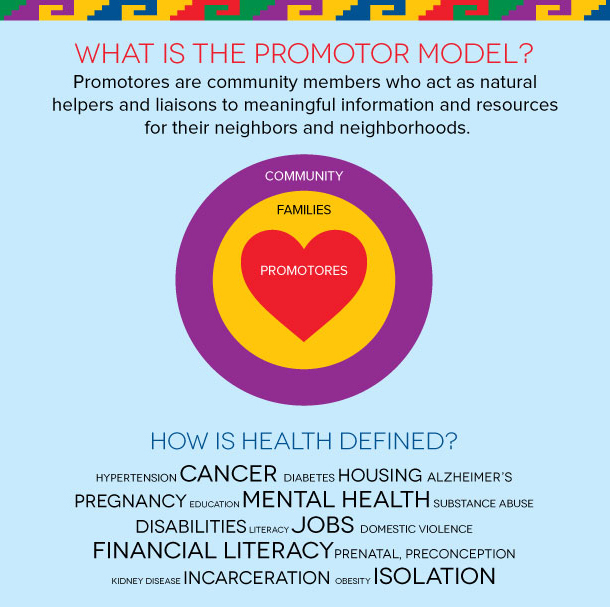 Promotores and Community Health Workers are liaisons (links) between their communities and health and social service providers. Because they share the same language, culture, ethnicity, status and experiences of their communities, Promotores are able to reduce the barriers to health education and services that are common for native-born and immigrant communities. The result is better health for more individuals, families and communities. Promotores may be volunteers or paid workers, and are also known as patient liaison, peer educator, health advocate, family educator, outreach worker or system navigator. Regardless of what they are called, Promotores build and maintain relationships of trust and respect within their communities, and understand the reality of how people live and the obstacles that keep them from success. Promotores work to improve conditions so that their children, and all children, will be healthy, better educated and productive citizens.